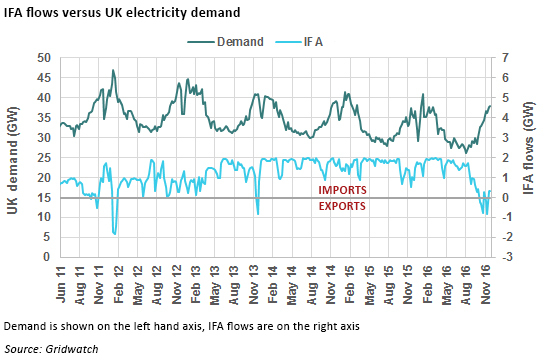 In my last post I commented on the impact low nuclear output in France could have on the UK electricity market, noting that if the interconnector switches to export mode, there would be a 4 GW net effect on UK capacity margins. Since then we have seen the news that due to damage sustained during recent storms, half of IFA’s capacity will be unavailable this winter. The Interconnexion France-Angleterre (IFA) between Folkestone and Calais is Britain’s biggest interconnector. National Grid has confirmed that four of IFA’s eight cables have been damaged, at a location approximately 3 miles off the coast in waters about 65 feet deep. These cables are heavily armoured and buried in the seabed, so this sort of damage is unexpected….there is some speculation that the cause was a ship dropping anchor during Storm Angus. National Grid’s determination of the capacity margin for this winter of 1.1%, boosted to 6.6% (3.4 GW) including the Supplementary Balancing Reserve, includes an assumed 2 GW of imports from France. The current outage wipes out the underlying capacity margin and means National Grid will have to reply on SBR and other measures to manage security of supply this winter. Since the start of this winter, the UK has been consistently exporting to France, as a result of the unusually low availability of the French nuclear fleet. The treatment of interconnectors from a security of supply perspective is complex. If the high demand in the UK is a result of cold weather patterns across Northern Europe, the demand could be even higher in France, as the French electricity system has a higher degree of temperature sensitivity (due to the widespread use of electric heating, unlike the UK where gas is more common). It is likely that France would need to limit exports and switch to importing in such circumstances, particularly this winter when nuclear availability is so low. 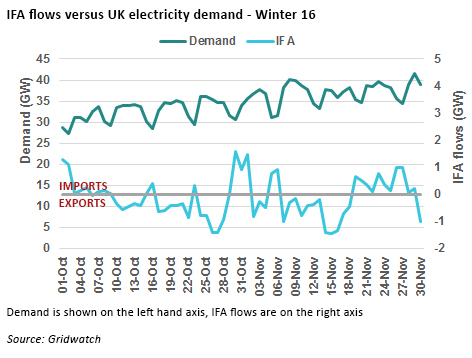 This suggests that including imports from France in the UK capacity margin may be optimistic in periods of high demand, and that in fact the current IFA outage could be positive for the UK’s security of supply this winter.